Vehicle servicing may not be a legal requirement, but having your car serviced on a regular basis is just as important as your annual MOT. There are a number of reasons why you should book your vehicle in with our servicing experts. The rewards owners of regularly serviced vehicles reap in terms of safety are perhaps the most obvious. Regular servicing means potential issues can be identified become they become expensive, difficult to repair and dangerous problems. Servicing checks all the components that are critical to your vehicle’s roadworthiness, giving you the peace of mind you need to drive worry free. Regular servicing is great for your pocket too. Whilst servicing represents an additional cost, failing to service your vehicle can actually cost you much, much more in the long run. The benefits don’t end there. Regularly serviced vehicles last longer, experience better fuel economy and generally have a higher resale value than those that aren’t serviced. As leading providers of professional vehicle repair and maintenance, we deliver the support car and van owners need to keep them and their vehicle safe. Vehicle servicing is an essential part of our offering, but for those new to servicing, what can be expected? How often you have your vehicle serviced all depends on its mileage and age. Your manufacturer will also make their recommendations on how often your specific make or model of vehicle should be serviced. Devising an appropriate service schedule for your vehicle is the key to unlocking all the advantages described above. Most vehicle owners book in for a professional service once a year. Some use the number of miles driven as an indicator of when to book in. A full service is generally required every 12,000 miles. It is also recommended that you have your vehicle serviced before and after long journeys. Still unsure about when your service is due? If you own a modern vehicle make and model, your car’s on-board computer will tell you when a service is required. This feature self diagnoses issues to offer helpful warnings to drivers which should not be ignored. 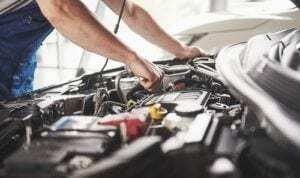 There are many types of services available, the aforementioned full service offers the most comprehensive approach to keep your vehicle in the best possible condition. An interim service is less inclusive. This service type is required every six months or 6,000 miles, whichever comes sooner. Oil and filter replacements may be required more frequently, depending on your vehicle’s condition and your driving habits. Manufacturers also provide a service as per their own specified schedule. Our Waterlooville based garage is well-equipped and its team skilled, trained and experienced to take on the servicing of all vehicle makes and models. We may use the Bosch car service schedule as a basis for our services to ensure every component is checked and serviced thoroughly, but our personalised approach means we go far beyond this to deliver servicing to the highest standards. Our time served, qualified team provides vehicle servicing that is best suited to your vehicle’s age, mileage and usage. As a result, no two services are the same with each tailor-made to the individual requirements of every vehicle. Our vehicle servicing provisions are the best around and we even road test, wash, vacuum, collect and return your vehicle to ensure a truly comprehensive and convenient solution for all our customers. All this at no extra cost! We can provide a specific quote for the bespoke servicing of your vehicle over the phone or via email. Simply get in touch with your vehicle’s registration and mileage. We will also need to know if your cambelt has been changed and if so, when, to provide an accurate quotation for your needs. Contact us today for further details on our vehicle servicing options or to obtain a free, no-obligation quotation.